On March 17th there will be an excellent house show featuring three incredible musicians. Erik Carlson (International Contemporary Ensemble, Talea Ensemble, etc.) and the Kalmanovitch Maneri duo will be playing at the former Nordon Grocery Store at 719 Devereux St., Raleigh, NC 27605 (corner of Devereux & Gaston) at 8pm. We are incredibly lucky to have three world class musicians playing in one of the most beautiful homes in Raleigh. There will be a suggested donation of $10 at the door. Erik Carlson will be playing the first set and is expected to play works by Jürg Frey, Manfred Werder, and other composers. Kalmanovitch Maneri duo will be playing a fully improvised set starting around 9pm. Special thanks to the Experimental Music Study Group for bringing Erik Carlson to town for a three day residency March 15-17. Check the EMSG Calendar for more information about Erik Carlson & R. Andrew Lee’s residency and sign up for the EMSG newsletter to be informed on future events. Erik Carlson has performed as a soloist and with many chamber and orchestral ensembles throughout Europe and the Americas. He is a highly active performer of contemporary music and has had works written for him by numerous composers, including Karlheinz Stockhausen, Tom Johnson, Jürg Frey, and Georges Aperghis. Mr. Carlson is an enthusiastic proponent of interdisciplinary collaboration, and performs frequently with poets, dancers, actors, and film. He is a member of the International Contemporary Ensemble and the Talea Ensemble and is the founder of the New York Miniaturist Ensemble. He has been featured on over a dozen recordings, including his own two recent albums of music for violin. Also a composer, he has had his musical compositions performed in a wide variety of venues. He studied violin with Jorja Fleezanis, Ronald Copes, and Robert Mann, and holds a Master’s degree from The Juilliard School. Mr. Carlson enjoys expensive bourbon and long walks on the beach. 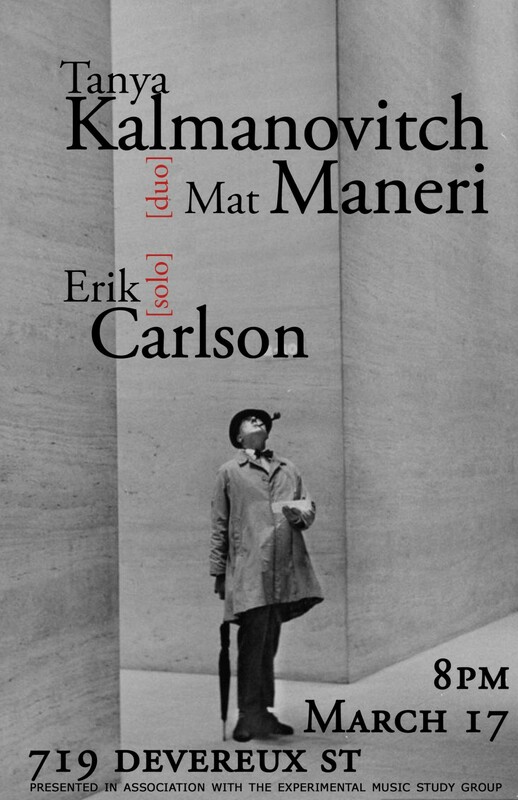 Praised for his high degree of individualism and a distinctive marriage of jazz and microtonal music, violist and violinist Mat Maneri has established an international reputation as one of the compelling artists of his generation. His recordings are widely acknowledged as among the most important developments in improvised music. Maneri lives in Brooklyn, NY and teaches at the New School. Over the course of a 25-year career, violist, writer and ethnomusicologist Tanya Kalmanovitch has continually re-defined what a 21st century musician can be. She teaches in the Department of Contemporary Improvisation at New England Conservatory, and is Coordinator of Entrepreneurship at Mannes College the New School for Music. Kalmanovitch lives in Brooklyn, NY. It can be difficult to write about what we do as improvisers. Perhaps it’s easier to explain it through a series of questions we’ve been asking, ourselves. What is chamber music? Is it repertoire, or rather an approach to creative collaboration? What is musical time? Is it linear? Cyclical? What is jazz when you remove its canonized instrumentation and approach? What are the essentials in the musical language we like to present?What are the styles and ideas that motivate us? Abstract art? Schumann lieder? Eliot Carter? How do we evoke these ideas without mimicry? What do you call this music? Is it chamber music; is it jazz? Is it Mahler? Is it free improvisation? I’ve worked with Tanya Kalmanovitch on and off for ten years and, of course, our musicality together has strengthened in that time. That being said, our very first encounter was a self-fulfilling prophecy. Two violas (an unusual instrumentation) improvising with no genre or premeditation, producing fully realized gems. How was this possible? Sometimes I feel there’s a hint of magic in it, but the best definition I can come up with is ‘exponential experience’ – a kind of super-consciousness, rare in even the best of musical collaborations, that involves some sort of alchemical transformation into some element much richer and deeper than we could each find on our own. In some ways, we’ve had very similar backgrounds: string players in the classical realm, both fighting our way into the jazz hierarchy, and both passionate about the extreme diversity in the music this world has to offer. We’ve also had many dis-similarities along the way, whether geographical (Tanya grew up in Alberta’s isolation, while I came of age in the environment of New England Conservatory), educational (Tanya studied at Juilliard, while I leaving the conservatory at 17 to work with the Joe Maneri Quartet) and gender (which was a big deal when we were coming up in through the jazz ranks). Through these differences and similarities, it was our hard-found empathy that allows for the shared, exponential experience that we are continuing to explore, fine tune, and share with others.